On a sun-dappled path, watched by two middle-aged women (aunt and grandmother?) and sister (? 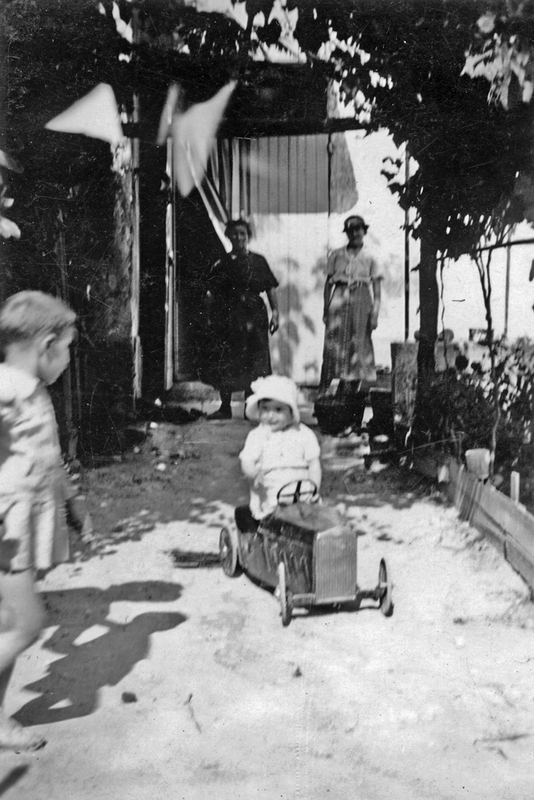 ), a little girl gets to grips with a splendid, shiny, pedal car. I imagine it was red! The appearance of the car together with the cloche hat the woman on the right is wearing, makes me think this was taken in the 1920s. The shadows are sharp, and a vine shades the path, suggesting that this is a Mediterranean scene. On the left, an enigmatic second shadow appears. It appears to be a younger woman, perhaps the little girl's mother, towards who the child is smiling. I am sure that with a few hours' searching I could identify the make of pedal car!